Currently, weather forecasts are calling for strong southwest winds this afternoon through tomorrow morning. Throughout most of this period, sustained winds between 30 and 45 km/hr are expected. Winds are expected to peak around mid-afternoon today with sustained winds of around 40 km/hr and gusts of around 60 km/hr, and then again late overnight or early tomorrow morning with sustained winds of 45 km/hr and gusts of around 70 km/hr. Environment Canada’s Marine Forecast has not yet issued any strong wind warnings, but suggests winds could reach as high as 55 km/hr and is predicting wave heights of around two metres during this time. 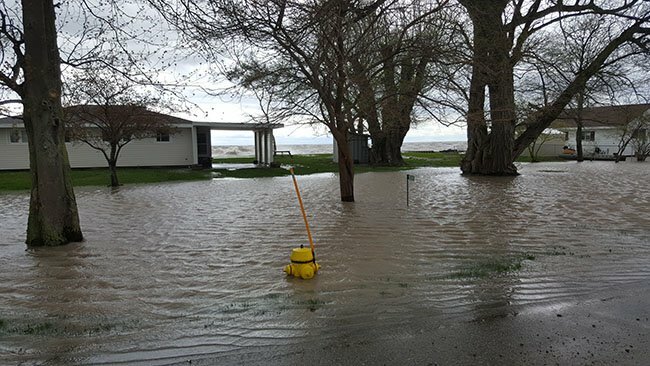 Earlier this year, flooding has occurred along Erie Shore Drive in Chatham-Kent when the area experiences sustained winds above 35 km/hr from a southerly direction (southeast through southwest). The forecasted wind speeds and wind direction this afternoon through tomorrow morning could be expected to create the conditions for flooding in this area. Associated with the flooding, there is a risk that wave action could damage shoreline protection works and cause shoreline erosion in vulnerable areas. While temperatures are expected to remain just above freezing during this period, should temperatures drop there is a risk of icy conditions both on private property as well as on the roadway. Residents in vulnerable areas along the Lake Erie shoreline should pay attention to local weather conditions . Officials will continue to monitor the situation and update this advisory if necessary . This message will be in effect until December 20th, 2017. Contact: Jason Wintermute ( jason. wintermute @ltvca.ca) regarding this message.